The Atlantic Concrete Association hosts an array of educational initiatives, social events and networking opportunities for its members and the industry. Check out upcoming industry events and training workshops. You can also register online by visiting our events page. 2019 ConAtlantic - February 21 - 23, 2019 in Halifax, NS at the Delta in downtown Halifax, NS! 2019 Board Meetings - January 21st (Halifax, NS), April 29th (Moncton, NB), August 17th (Family Fun Board Meeting, Digby Pines Hotel), October 21st (Halifax). Dates and locations may change. 2 Day Basic Concrete Course - March 27-28, 2019 in Moncton at the Days Inn. Congratulations to Grace MacKenzie & Jake Hiscock, the 2018 recipients of the Atlantic Concrete Association Memorial Scholarship! Congratulations to Grace MacKenzie & Jake Hiscock, our 2018 recipients of the Atlantic Concrete Association Memorial Scholarship! ACA is excited to introduce our 2018 winners of the Memorial Scholarship established in memory of Simon Coffey. 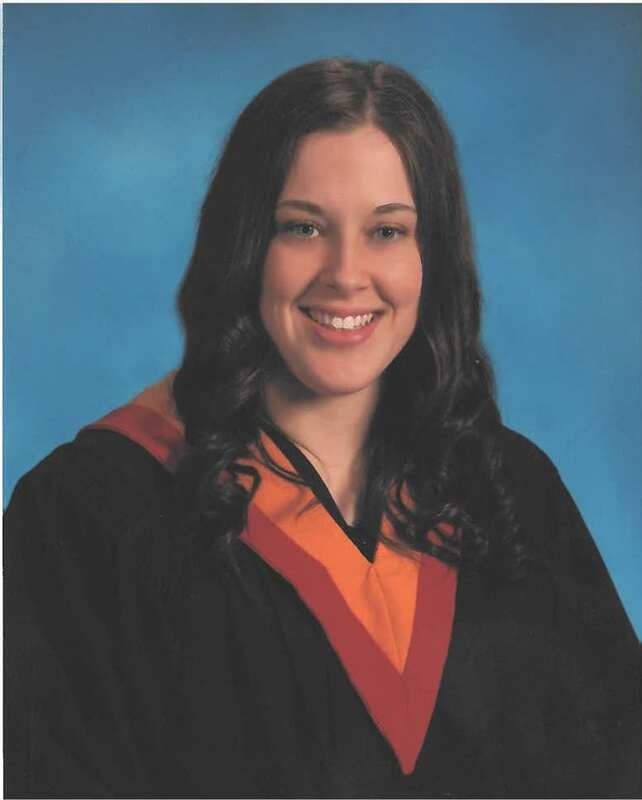 Grace MacKenzie, daughter of Steve and Kenda MacKenzie of Ocean Contractors Limited, graduated from Sir John A MacDonald High School this spring and will be starting Acadia University in the fall. Grace has choosen a career in Engineering. Jake Hiscock recently graduated from Cobequid Educational Centre in Truro and will be studying Engineering as well at Carleton University in September. Jake is son to Wayne and Elizabeth Hiscock. Wayne is an employee of Lafarge Canada. The committee based their decision on academic achievement and an essay submitted by all the candidates. The Atlantic Concrete Association would like to congratulate Grace and Jake and wish all our entrants good luck in all their future endeavors! 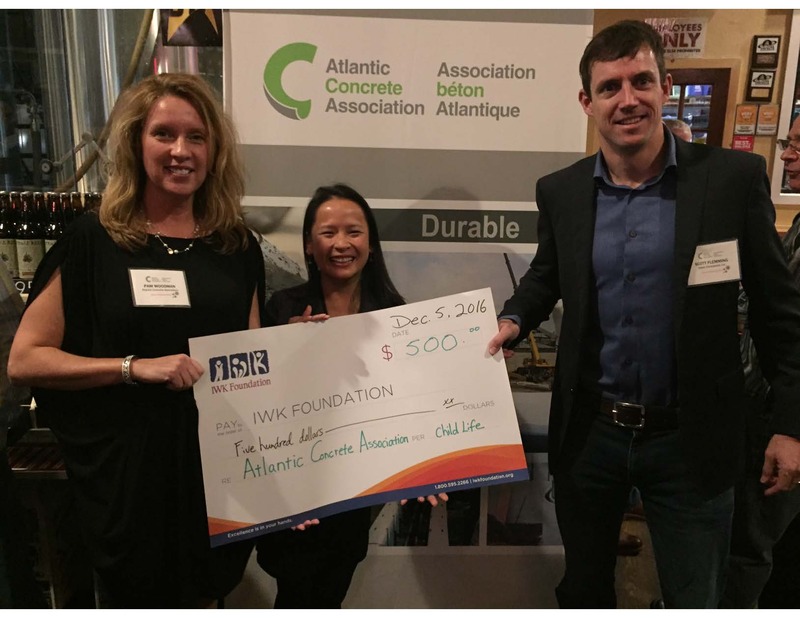 On December 5th, the Atlantic Concrete Association hosted its 7th annual DecementFest at the Garrison Brewery in downtown Halifax. Each year ACA members and invited guests get together for a little entertainment and socializing to kick off the holiday season. 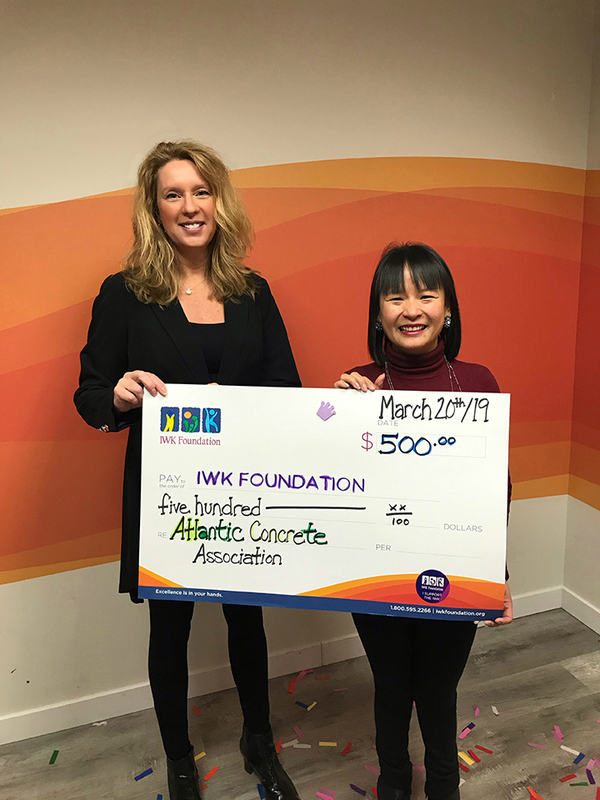 To celebrate this year, ACA donated $500 to the IWK Foundation for the Child Life Department for Christmas Needs program to help children during the holidays at the IWK. Pam Woodman, Executive Director of the ACA, accepts a Bowman Award during ceremonies on October 1. in Digby NS. 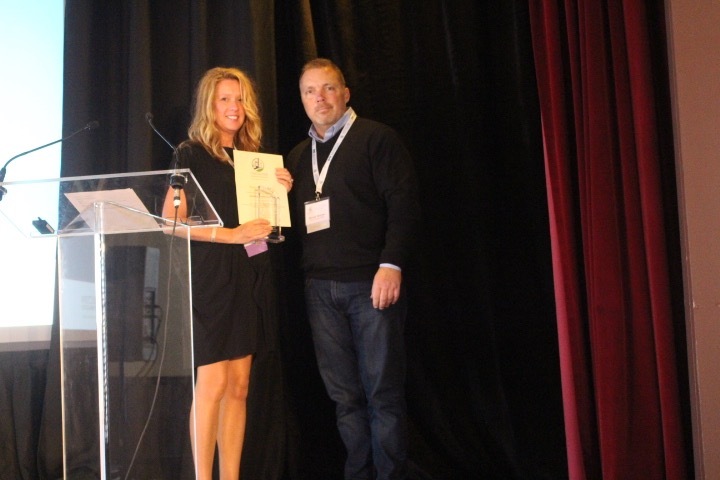 The award is presented each year by the Construction Associaiton of NS (CANS) to recognize companies that have held continous membership for more than 25 years. The award is named after Earle Bowman of Fundy Construction, a past president and honourary life memebr. To honour the efforts and grand achievements of this prolific mover and shaker in the construction industry, companies are awarded for their years of membership and displaying a degree of dedication that would make Earl Bowman proud. Photo: Pam Woodman (ACA, Executive Director) accepting Bowman Award on behalf of ACA.